Three different designs of gold dollars were issued by the United States. They are very small, only about 2/3rds the size of a dime. They were the smallest regular issue coins made by the United States.Type I, minted from 1849 through 1854, features a head of Liberty wearing a beaded coronet or crown surrounded by stars. Type II, slightly larger than the first design, has a head of Liberty in a feathered Indian headdress surrounded by United States of America. This type was made in 1854 and 55 only. 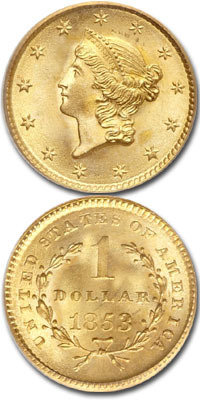 The Type III Gold dollar was made from 1856 through 1889 and has a similar design to the second type except that the head is much larger. On all three types the mintmark, if any, can be found below the wreath on the reverse. 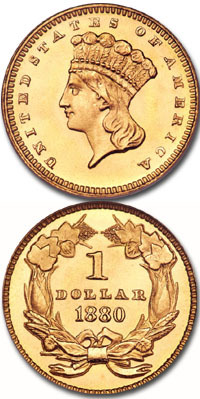 Type II Gold Dollars are scarcer than either of the other types, and in average condition are worth about $300. In perfect uncirculated condition Type Twos are very rare and can bring $70,000 or more. Type III Gold Dollars are the ones most commonly found and are often used in jewelry, particularly bracelets and earrings. Many counterfeits were also made of this design, most notably having the dates 1861 or 1862. Type I gold dollars were also used for jewelry but to a lesser extent. The average genuine specimen of either Type I or Type III is worth about $180.